1) This paper has been presented at the FIG Congress in Sydney, April 2010, and has been revised March 2011. This article is a contribution to develop models for transferring cadastral information at international level. In Europe, INSPIRE theme Cadastral Parcels has introduced a model for cadastral spatial data. Work with a wider perspective is currently taking place as ISO work, where the objective is to provide an international standard for the information used in land administration (Land Administration Domain Model). This article presents the Finnish cadastre and the concepts of basic property unit, parcel and right-of-use unit. The implementation of the INSPIRE Cadastral Parcels model in Finland is analyzed and could work as inspiration for other countries in their work. Efforts are currently made to develop models for transferring cadastral information at international level. For this purpose harmonization of national models, at least the core objects, is required. In Europe, INSPIRE theme Cadastral Parcels has introduced a model for cadastral spatial data. Work with a wider perspective is currently taking place as ISO work, where the objective is to provide an international standard for the information used in land administration (Land Administration Domain Model, LADM). Finland has participated in both processes. This paper briefly presents the Finnish cadastre and the concepts of basic property unit, parcel and right-of-use unit. The implementation of the INSPIRE Cadastral Parcels model in Finland is analyzed. The LADM conceptual model has been examined by making a pre-analysis how the concept of right-of-use unit fits into the LADM model. Finally, the experiences of the work - both international cooperation and implementation at national level - are described. Efforts are currently made to develop models for transferring cadastral information at international level. For this purpose harmonization of national models, at least the core objects, is required. This poses new challenges for the development at national level. In Europe, INSPIRE theme Cadastral Parcels has introduced a model for cadastral spatial data. Directive 2007/2/EC of the European Parliament and of the Council of March 2007 establishing an Infrastructure for Spatial Information in the European Community has caused a lot of work for implementing the rules of the directive. Cadastral parcels were included in the work. This work has focused on the geographical part of cadastral data. The INSPIRE model is binding and the data product specification has to be implemented at national level for INSPIRE information service. Work in a wider perspective is currently taking place as ISO work (ISO 19152), where the objective is to provide an international standard for the information used in the land administration domain. The emphasis is on the particular part of land administration that is interested in view of rights, responsibilities and restrictions affecting land and water and the geometry thereof. The Land Administration Domain Model (LADM) is currently in progress and is to become an international standard. The LADM model is a conceptual model and not a data product specification. Finland has taken part in both processes; in INSPIRE as a member of the thematic working group Cadastral Parcels and also in testing and commenting, and in LADM as a participant in the work of the project team and the editing meeting as well as in commenting. This paper concentrates on data modelling with the terminology used in modelling. In Finland all cadastral information - both map data and attribute data - are registered in one integral database (started in 1998 and renewed in 2005) managed by the National Land Survey of Finland. Surveyors working at the National Land Survey and in certain municipalities are responsible for carrying out legal surveys, measuring data and registering it in the database. The system has been renewed and expanded in 2005 and during that time, it was modelled thoroughly with UML figures, and XML/GML schemas for data transfer were introduced. The main objects in the cadastre include basic property units, parcels, boundaries and right-of-use units. Transactions are also recorded in the register. Also information on ceased units is preserved. The history of geometry is maintained as simple geometry. All geometry is currently 2-dimensional. The Official Purchase Price Register is integrated into the cadastre. Since the beginning of 2010 The National Land Survey has been responsible for registering titles and mortgages but this particular database is separated from other registers and will be renewed. 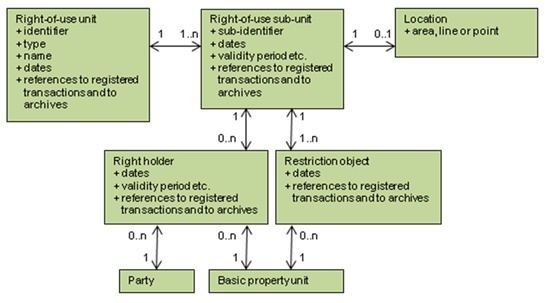 A basic property unit is the basic unit in registration and it is provided with a unique identifier. The unit consists of one or several single areas (parcels) which are not provided with unique identifiers. In some cases a basic property unit can be registered without an actual area and only have shares in common areas. The whole country (land and water) is divided into parcels. Public areas are also included. Some minor areas are found in between which are to be renewed. The cadastral map is an index map. The measurements etc. are found in cadastral survey maps which are stored with other cadastral survey documents nowadays in digital archives. See the concept in Figure 1. Rights and restrictions defined in Cadastral Acts must be registered (since 1998) as right-of-use units. Both users and developers have considered this concept as very successful. Different types of right-of-use units are defined in Acts, e.g. rights and restrictions defined in the Real Estate Formation Act (private roads, wells, landing places for boats etc. ), in the Land Use and Building Act (building easements etc.) and other Acts (private roads, fishing restrictions, protected areas, mining rights, restrictions according to Highways Act and Railway Act, snowmobile driving routes etc.). Every right-of-use unit is provided with a unique identifier. Right-of-use unit can be composed of one or more sub-units. With some exceptions (e.g. private graves under private data protection) right-of-use units have to be located on the cadastral map and the location of the sub-units (area, line or point) is registered. Also the information of the right holders and the restriction objects are registered for the sub-units. Figure 2 shows the case of typical servitudes. The basic property unit A needs a well for taking water for household consumption. This well is located inside basic property unit B and the water pipe is located in three basic property units (B, C and D). These rights are registered as two right-of-use units with one sub-unit: one for the well as a point (W) and one for the water pipe as a line (P). The right holder for both units is basic property unit A. The restriction object for W is B. The restriction objects for P are B, C and D.
Rights and restrictions are registered in most cases between basic property units (never between the owners of the basic property units). In some cases, the right holder can be a juridical person, like a municipality e.g. with a sewer network or an energy company with an energy network. In very few cases the right holder is not registered (e.g. public road maintaining cases where the right holder is obvious). The restriction objects are always basic property units and not parcels (parcels are not registered with identifiers). The restriction objects are registered in the database with date and transaction etc. information which makes it possible to easily to register and change the information on each relationship and also to store the history of changes. In some rare cases the right holder and the restriction object cannot be separated (some building easements) and they are technically registered as participants. The overlay of geometry is used during the registration process to help recognizing the restriction objects. Otherwise overlay is not used. The problem with overlay is that it does not always provide the correct information, e.g. the locations are not always registered with the same accuracy. It is not possible to store relationship information as overlay provides only temporary information. Overlay is for example suitable for calculating values but not for dealing with legal rights and with liability of damages by incorrect registration. In information services overlay can be slow for producing the required data. The concept of right-of-use unit is shown in Figure 3. 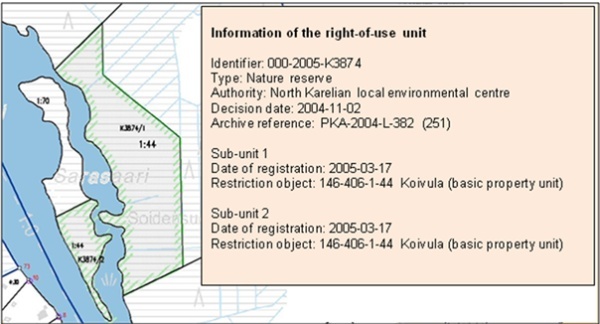 Figure 4 shows the case of a right-of-use unit for a protected site. Right-of-use unit identifier is 000-2005-K3874. It includes two sub-units and the restriction object is the basic property unit 146-406-1-44. The environmental authority provides the data, not the cadastral registry. Thus, the responsible authority, the date of the original decision and the archive reference are also registered. The INSPIRE work has focused on the geographical part of cadastral data. The purpose is to use it as reference data for other information belonging to a specific thematic field such as environment, soil, land use etc. Harmonising the concepts of ownership and rights related to the parcels are not included in the scope of INSPIRE. The attribute national cadastral reference which is included in the model can be used at a national level to obtain information from national data sources according to national legislation. Buildings, land use and addresses are included in other INSPIRE themes. INSPIRE Cadastral Parcels model consists of four spatial object types: cadastral parcel (the core object, basic property unit, cadastral zoning and cadastral boundary. Figure 5 shows the model. Cadastral parcels are defined in the INSPIRE Directive as “areas defined by cadastral registers or equivalent”. As much as possible, in the INSPIRE context, cadastral parcels should be forming a partition of national territory. Cadastral parcel should be considered as a single area of Earth surface (land and/or water), under homogenous real property rights and unique ownership, real property rights and ownership being defined by national law. Basic property units are the basic units of ownership that are recorded in the land books, land registers or equivalent. They are defined by unique ownership and homogenous real property rights and may consist of one or more adjacent or geographically separate parcels. In the INSPIRE context, basic property units are to be used by countries where unique cadastral references are given only for basic property units and not for parcels. Basic property units allow these countries to provide information about area or about temporal validity in the cadastral registers. Cadastral zonings are the intermediary areas (such as municipalities, sections, and blocks) used in order to divide national territory into cadastral parcels. In the INSPIRE context, cadastral zonings are to be used to carry metadata information and to facilitate portrayal and search of data. Cadastral boundary is defined as a part of the outline of a cadastral parcel. In the INSPIRE context, cadastral boundaries have to be made available by European Union Member states where absolute positional accuracy information is recorded for the cadastral boundary. INSPIRE obligates to provide information service, where the transformation file format is harmonised. Parcel is the core object in the model. The INSPIRE information service in Finland can be summarized as follows: transferring valid parcels and the information of the basic property units related to them. See Figure 6. Cadastral parcel and basic property unit are the object types which will be provided. The provided attributes for parcel include the INSPIRE identifier, national cadastral reference, begin lifespan, geometry and reference point with a label. The attributes provided for the basic property unit include the INSPIRE identifier, national cadastral reference, area value and validation date. In addition the association from parcel to the basic property unit and the association from basic property unit to administrative unit will be provided. Finland will not provide cadastral zonings because no zonings within the scope of INSPIRE exist. Finland will not provide cadastral boundaries because the estimated accuracy is recorded only for cadastral points and not for cadastral boundaries. Land Administration Domain Model (LADM) is a reference model. It provides terminology for land administration which can be used in different formal and informal practices and procedures in various jurisdictions. One purpose is to provide a basis for the development and refinement of efficient and effective land administration systems. Another purpose is to enable countries involved to communicate using a jointly shared vocabulary implied by this model. LADM is a conceptual schema and it consists of objects which model parties, basic administrative units and spatial units as well as associations between them, which in turn consist of rights, responsibilities and restrictions. LADM does not interfere with the national legislation and processes. External databases comprising party data, address data, valuation data, land use data, archive data and taxation data remain outside the scope. One object of this model is to provide a basis for national and regional profiles. This case concentrates on examining how the LADM model fits the Finnish concept of right-of-use unit. This is done by analyzing the main objects and associations. Figure 7 shows the core objects used in this case and Figure 8 shows the result of the pre-analysis. The definition of a basic administrative unit is the following (LADM document): administrative entity consisting of zero or more spatial units corresponding to (one or more) unique and homogenous rights (e.g. ownership right or land use right), responsibilities or restrictions associated with the whole entity, as included in a land administration system. Definition of a party is the following (LADM document): persons, or group of persons, or juridical persons that compose an identifiable single (legal) entity, or a basic administrative unit. The Finnish concept of basic property unit and parcel fits the LADM concept of the basic administrative unit and spatial unit. The right-of-use unit as an object fits the LADM basic administrative unit. The right-of-use unit consists of one or several right-of-use sub-units. Also the right-of-use sub-unit as an object fits the LADM basic administrative unit. A relationship is needed to show the hierarchy between the right-of-use unit and its sub-units. The required relationship is modelled for topology relationships. To model the hierarchy the alternative could be to add a new association from the basic administrative unit to itself (same kind of association as the spatial unit has). This should be added to a country profile because LADM does not currently support this. The right-of-use unit has no geometry but its sub-units can be located. The locations of the right-of-use sub-units fit the LADM spatial unit. The location can be an area, a line or a point which fits to the LADM concept. Right holder (connected to the right-of-use sub-unit) fits the LADM party. 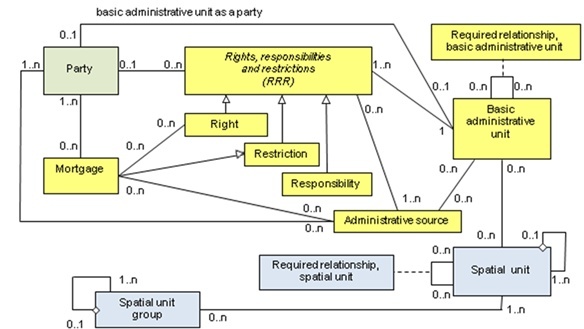 In a normal case a basic property unit holds the right; it plays the role of a party (basic administrative unit as a party). In other cases e.g. if the right holder is a certain municipality or a juridical person (for example energy company), it is a LADM party itself. Restriction object (connected to the right-of-use sub-unit) fits the LADM required relationship (required relationship of basic administrative unit). Polygon overlay is not used because it is not possible to store the relationship information when using overlay. Also some accuracy and legal aspects as well as data missing cases disable the use of overlay. Objects and terminology in INSPIRE and LADM models are not fully comparable. Firstly, INSPIRE is a model for a data product specification and LADM is a conceptual model. Secondly, INSPIRE UML model is a basis of the automatic production of XML/GML schema (transfer file format). This requires exact modelling. Thirdly, LADM is a generalized model with a few objects for many purposes. Therefore, its scope is more for data harmonisation than for data transfer. Common code lists at least at the main level are required if comparison of information between various countries is needed. LADM code lists are presented as informal information and they will therefore be included in the country profiles. Country profiles make it possible to use precise terminology using legal aspects. The INSPIRE Cadastral Parcels model does not include any essential code lists. The work to reach consensus about common code lists is to be done in future. Services expressed in INSPIRE legislation must be implemented using this model. To define transformation rules from national databases to INSPIRE services including all exceptional cases can be complicated, although the INSPIRE model itself seems to be quite simple. A lot of work was required to compile the terminology of objects (e.g. parcel and basic property unit). Countries, in which the basic unit for registration is a basic property unit (called e.g. real estate, cadastral unit, real property unit) considered it necessary to include this object in the model to fulfil the requirements of INSPIRE, as others experienced this as tedious extra work. Finally, the object was added to the model as defined in the document UN/ECE 2004 Guidelines on Real Property Identifiers. the Finnish system and no such identifier is required. The registered object is a basic property unit which has the unique identifier. The need in the on-line data information service to query individual parcel information is obscure, if the basic property unit is the legal basic object provided with an identifier at national level. The area value for the basic property unit will be the total of legal land area and legal water area. Values for wider areas are rounded and shown in hectares for customers; INSPIRE requires area values in square meters. Area values for parcels are not registered. The calculated area is not legal and it is not shown to customers. All temporal values are stored at day level. The legal data is registered at day level. INSPIRE temporal value definitions also include time. If INSPIRE product does not fulfil national use cases, it means extra work and could therefore cause more costs than benefits at least in the short run. The result of LADM work will be an international standard. Currently the work is in the draft stage of an international standard. The data model has been changed a lot between the meetings owing to a large number of comments. This shows something about the difficulty of the modelling. It is still possible that the model needs a few, new review cycles to provide a more stable result. In LADM the academic freedom of modelling is limited because land administration as a domain is related to legal aspects in such a large extent. On the other hand, LADM is just a conceptual model and therefore it can be seen in a positive way and accepted more easily than the INSPIRE model. The present stage of LADM work shows that a common model is possible. Then again several unequal country profiles prove that a common model has not yet been achieved. To participate in international work so fully as to create concrete models has been a unique and interesting experience. It has also brought along new views to existing systems that has been very useful. To be objective in the work is challenging because it is not easy to break away from the national point of view. It is only natural since the national system is the best known to everyone and especially if the responsibility for implementation at natural level is predictable. Practically it might be challenging to find motivation and especially resources to adjust the national systems to international models or even just to make the harmonised transfer files. ISO/DIS 19152.1, Geographic information - Land Administration Domain Model (LADM), version 2009-12-07. INSPIRE DS-D2.8.I.6, INSPIRE data specification on Cadastral Parcels - Guidelines, v3.0, 2009-09-07. UN/ECE, 2004, United Nations/Economic Commission for Europe, Guidelines on Real Property Units and Identifiers, United Nations, New York and Geneva, 2004. Information System and several Information Service projects). The last few years she has also been involved in the INSPIRE thematic working group Cadastral Parcels set up by the European Union and ISO Land Administration Domain Model working group. She has been the Finnish delegate to FIG Commission 3 since 1998. Tarja Pykälä is a Master of Science (Surveying). She has worked at the National Land Survey of Finland since 1981 on several cadastral development projects, for example the JAKO cadastral system and KTJkii cadastral system. She has also participated as an expert in the Finnish INSPIRE and LADM working groups.